선림원터 안의 서쪽 언덕 위에 놓여있는 돌로 만든 등이다. 선림원은 신라의 옛 절로, 이 곳에서 출토된 신라범종을 통해, 당시 해인사를 창건했던 순응법사(順應法師)에 의해 창건되었음이 밝혀졌다. 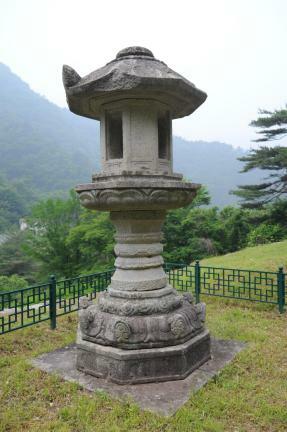 지금은 이 터가 경작지로 변하였으나, 여러 유물들이 남아있고 각종 기와와 토기조각들이 아직까지도 발견되고 있어 그 규모를 짐작하게 한다. 일반적으로 석등은 불을 켜두는 곳인 화사석(火舍石)이 중심이 되어 아래에는 이를 받치기 위한 3단의 받침돌을 쌓고, 위로는 지붕돌과 머리장식을 얹었다. 이 석등은 신라시대의 전형적인 8각형식을 따르면서도 받침돌의 구성만은 매우 독특하여 눈길을 끈다. 아래받침돌의 귀꽃조각은 앙증맞게 돌출되어 아름답고, 그 위로 가운데받침돌을 기둥처럼 세웠는데, 마치 서 있는 장고와 같은 모양이며 그 장식이 화려하다. 즉 기둥의 양끝에는 구름무늬띠를 두르고 홀쭉한 가운데에는 꽃송이를 조각한 마디를 둔 후, 이 마디 위아래로 대칭되는 연꽃조각의 띠를 둘러 모두 3개의 마디를 이루게 하였다. 화사석은 8각으로 빛이 새어나오도록 4개의 창을 뚫었고, 각 면의 아래에는 작은 공간에 무늬를 새긴 매우 드문 모습을 취하고 있다. 지붕돌은 8각의 모서리선이 뚜렷하며, 추녀에는 아래받침돌에서 보았던 같은 모양의 귀꽃조각이 장식되어 있다. 경사진 면은 가파르지 않고 부드러운데, 귀꽃조각과의 어우러짐이 자연스럽다. 꼭대기에는 연꽃이 새겨진 머리장식의 작은 받침돌만 남아 있다. 지붕돌이 일부 탈락되긴 하였으나 완전하게 남아 있으며, 전체적인 양식과 장식적으로 흐른 조각 등은 통일신라시대 작품인 담양 개선사지 석등(보물 제111호)과 거의 같은 모습이다. 같은 절터내의 양양 선림원지 홍각선사탑비(보물 제446호)와 함께 신라 정강왕 원년(886)에 세워진 것으로 추측된다. 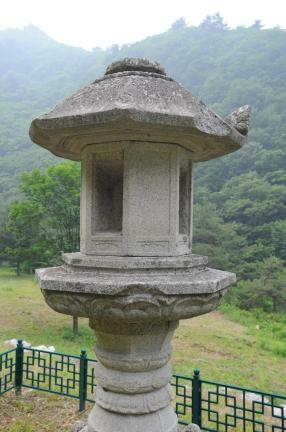 This stone lantern is located on the western hill inside the former site of Seollimwon Temple, which was established during the Silla Dynasty. 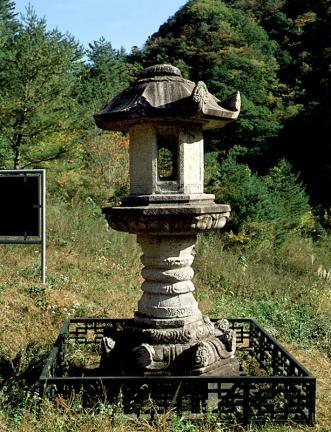 When a Buddhist temple bell with inscription dating from the Silla period was discovered at this site, it was discovered that the temple was founded by Monk Suneung, who is also known as the founder of Haeinsa Temple. 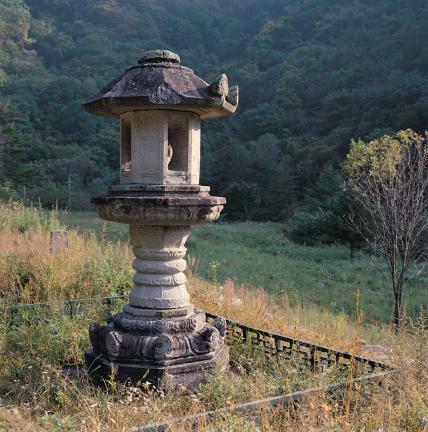 Although the site is now little more than a plowed field, it is assumed – judging by the remaining relics and the roof tiles and fragments of pottery that are unearthed on a regular basis - that the temple would have been very large. 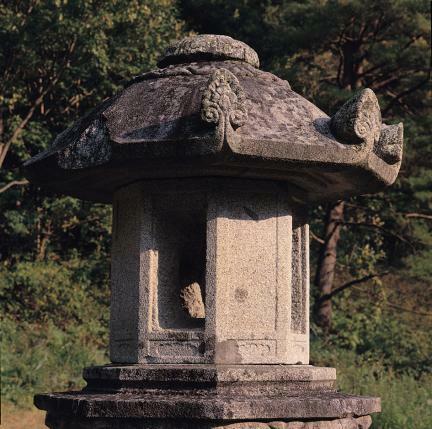 Like other stone lanterns, it consists of a light chamber in the middle, three-tiered supporting stones at the bottom, and a top part composed of roof stone and finial. 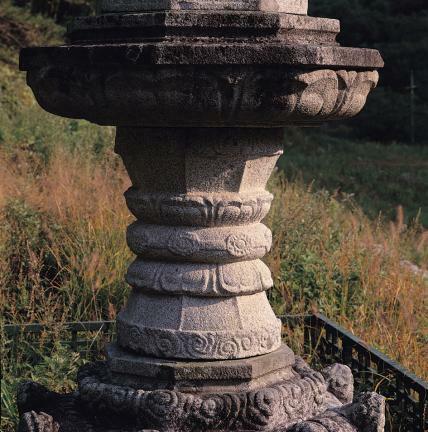 This particular stone lantern follows the typical style of octagonal stone pagodas of the Silla period, and has a distinctly unusual supporting stone. 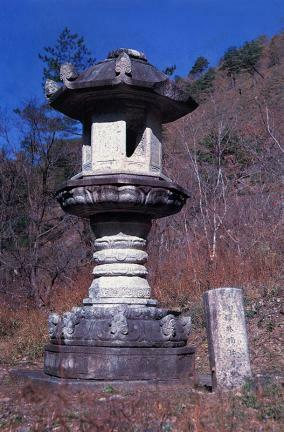 The bottom tier of the supporting stone is beautifully engraved in relief with a flower design; the pillar-shaped middle tier has the shape of a janggu (traditional Korean drum) and is splendidly adorned. 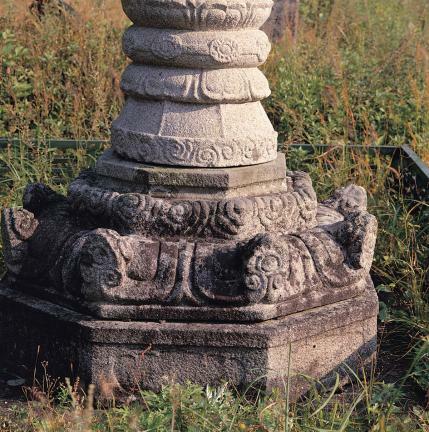 Both ends of the middle tier are decorated with cloud patterns, and the narrow middle area is composed of three bands – a center band engraved with flower patterns, and two other bands carved with lotus flower patterns. 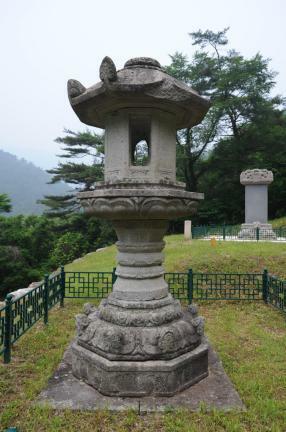 The octagonal light chamber has four windows through which light could escape. 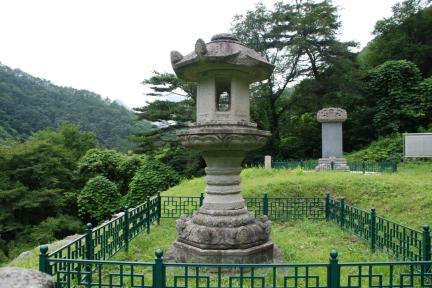 The lantern has a special feature in that the lower part of each side is engraved with a pattern in a small space. 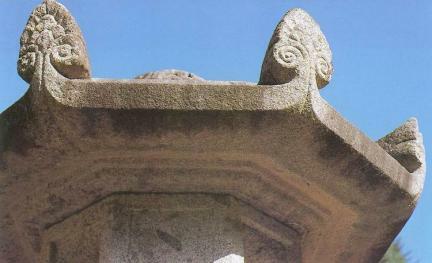 The roof stone has eight clear edges and corners of the eaves with the same flower decoration carved in relief on its edge as that of the lower supporting stone. The outer surface of the roof curves gently, matching nicely with the flower sculpture. 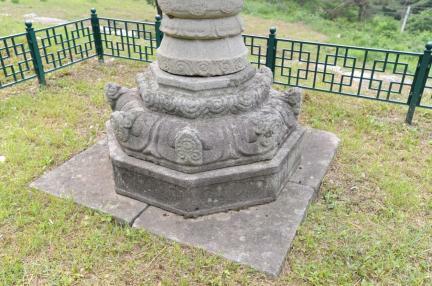 Of the upper part of the lantern, only a small finial base engraved with lotus flower patterns remains. 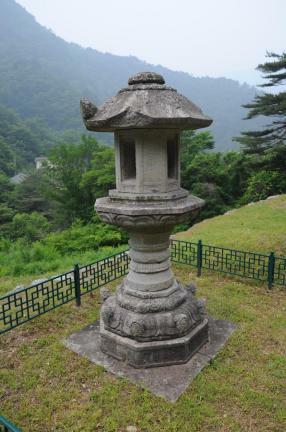 Although some parts of the roof stone are missing, the lantern is relatively well preserved. 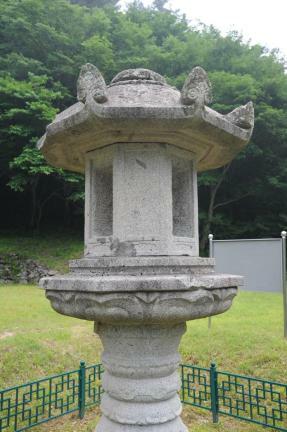 Judging from the general style and carving of the lantern, it is similar to the Stone Lantern at the Gaeseonsa Temple Site, Damyang (Treasure No. 111). 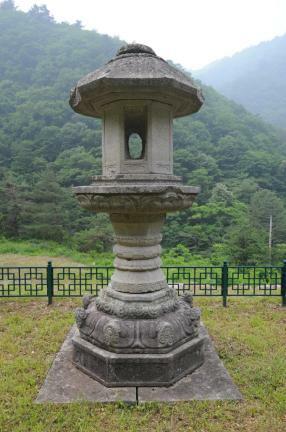 It is assumed that this stone lantern was also erected in 886 (the first year of the reign of King Jeonggang of the Unified Silla Dynasty), at the same time as the Stele for Master Honggak at the Seollimwon Temple Site, Yangyang (Treasure No. 446).